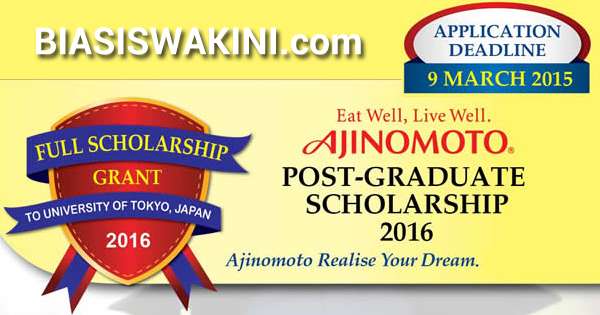 Ajinomoto Post-Graduate Scholarship 2016. Full scholarship grant to University of Tokyo, Japan. - Are highly interested to pursue an overseas master degree in the field of science (except Medicine & Veterinary Medicine). - Graduated or be expected to graduate from College/University with excellent academic performance. - Are Malaysian who will not be more than 35 years of age by 01 April 2016 and will not be receiving other scholarship. - Applicants must acquire adequate Japanese language proficiency. (Only applicable to those enrolling as a master's course student program - Two-years program). - In good physical and mental health and have a strong motivation for learning. - Full examination. admission and tuition fees coverage. - One way air ticket to Japan is provided. 1. Research Student Program + Master's Course Student Program (Three-years program). 2. Master's Course Student Program (TWO-years program). HOW TO APPLY AJINOMOTO SCHOLARSHIP 2016 ? - Original transcript of scholastic record issued by the UNIVERSITY or graduate school attended. - Other documents that are required to support your application. * The documents submitted shall not be returned under any circumstances. ** The required document vary according to course. Please refer to “Appendix 2’ for details. 0 Komentar untuk "AJINOMOTO SCHOLARSHIP GRANT 2016 - BIASISWA AJINOMOTO 2016"